People light candles in front of a Catholic church during the Easter Vigil in the Siberian city of Krasnoyarsk, Russia, April 4. A Russian church official said the bishops’ conference is studying the implications of a new government law tightening control over the funding of churches and religious associations. (CNS photo/Ilya Naymushin, Reuters) See RUSSIA-LAW April 22, 2015. 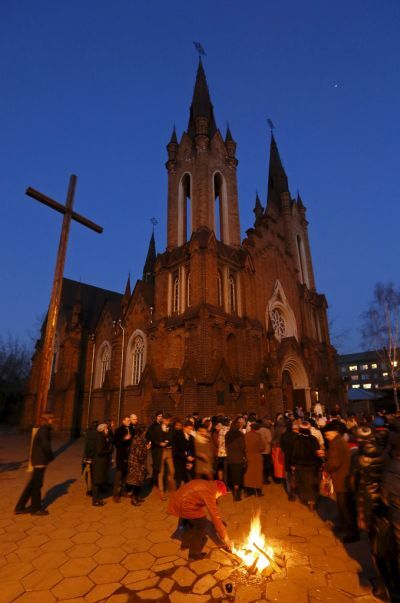 WARSAW, Poland (CNS) — A Russian church official said the bishops’ conference is studying the implications of a new government law tightening control over the funding of churches and religious associations. “What matters in Russia isn’t what the laws say, but how they’re interpreted and applied by local officials,” said Msgr. Igor Kovalevsky, secretary-general of the five-member bishops’ conference. In mid-April, Russian President Vladimir Putin approved a law requiring all churches with funds and property from abroad to file detailed reports about their staffers and activities. Russian media said the draft law was intended to prevent the involvement of religious groups in “terrorist and extremist activity” or “violations of Russian law,” but added that it had been criticized as a threat to religious freedom by Christian, Muslim and Jewish representatives. “However, having already had to submit records to the Justice Ministry on foreign funds received by Caritas and other Catholic charities, we’ll have to see how this new law affects our work,” Msgr. Kovalevsky said. Police have raided offices of Amnesty International, Human Rights Watch and other foreign-linked groups under the law, which was heavily criticized by the European Union and U.S. State Department.